Kathleen and Ollie Johnson are the power couple behind Dr. Miracles hair care products. I recently had the chance to talk to them about how they’ve managed their business and marriage partnerships so well while also homeschooling their three children. Rather than parse out their words, I'm giving you the entire interview. A very interesting and funny couple! Me: Do you find that working together so closely enhances or challenges a marriage? Kathleen: For us, it’s an enhancement because we have a mutual interest outside of the marital norms. It is hard for men and women to find things to share that they can both be passionate about. This is something that means a lot to both of us. Ollie: Working together has given us an unusual opportunity to share in the Dr.
Miracle’s journey. Since we are not performing the same job functions, we bring unique perspectives to working together. Me: How do you handle disagreements? Kathleen: Yelling, violence and generally being irrational. Ha, Ha, Ha...just kidding. Ollie: We talk out our positions when there are disagreements. Usually there is room for compromise. 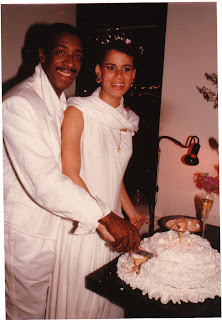 Kathleen: After 26 years of marriage we know we have different views and have learned to listen to each other and take time to consider the other's point of view. I respect Ollie's viewpoint based upon his years of hands-on experience while I may bring a "looking at the forest outside of the trees” view. Each view has value to us. Me: Is it difficult to create "alone time"? Ollie: We manage “alone time” when we feel we need it. Sometimes taking a trip to the country is a good remedy. Kathleen: Since our children are grown-up, we are enjoying the freedom that comes with not having to be regulated by meals and bedtimes. It's great being able to travel together more and be spontaneous. Me: Do you feel the media does enough to show the reality of black love and black families? Kathleen: I feel that the media does “very little” in the way of positive affirmation of the Black family or Black love. The positive aspects of the Black family are rarely highlighted and not enough media attention is spent on those couples who represent positive family values. Ollie: Television doesn't do much to show the reality of most things. It just doesn't sell advertising. What people want is drama. To see a family at peace with one another and living normally is not exciting, but it is a blessing. Me: So, how did you spend Valentine’s Day? Ollie: We went for a couples massage in the afternoon. Afterwards we were picked up by a limousine that took us to a very romantic restaurant. Kathleen: It's just a nice day to do something together like go to a fabulous restaurant in SoHo (New York) for some great spicy Thai food. 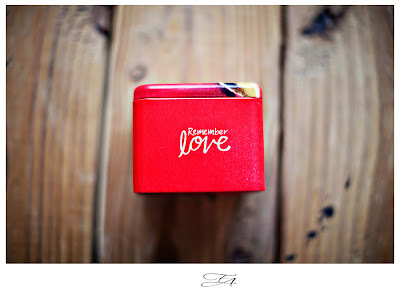 We exchanged little gifts to express our love for each other. Finding ways to say "I love you" is always important. We don't take what we have for granted. 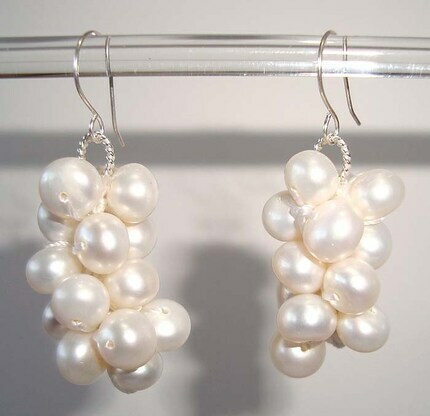 Tophandmadejewelry - Freshwater pearls and only $5.95! 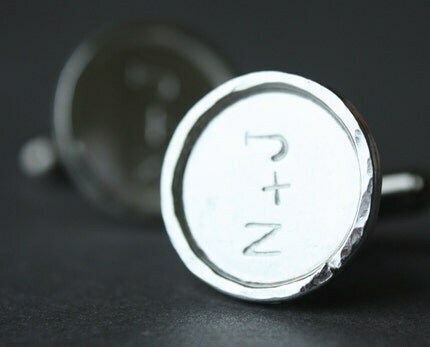 Beads in the Belfry We love cufflinks as a gift for a groom. 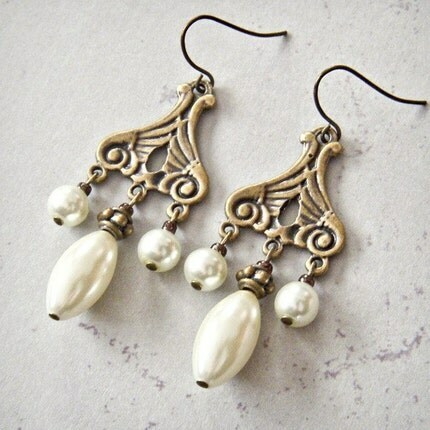 SarahBethDesigns Adorable earrings for bride or maid-of-honor. Update: We have a venue! 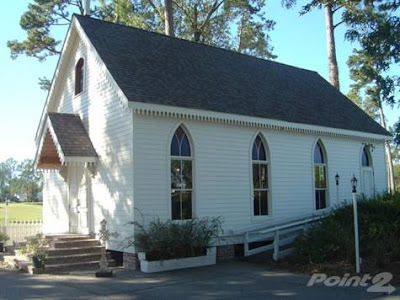 We paid the deposit and now this cute little chapel is ours. 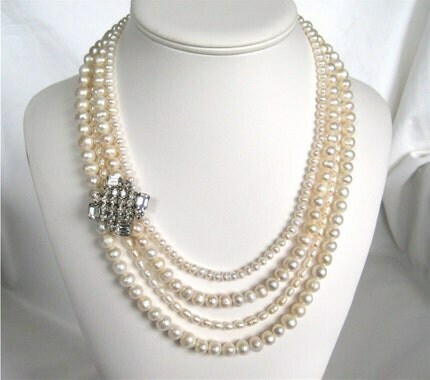 I plan on having it draped on the inside. It's a tad bit rustic for my taste, but that's nothing that linens and drapery can't fix. 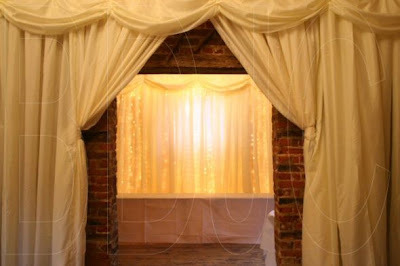 Here are some ideas I have for the drapery and decor. We're having a great start to 2010 and we're hoping our readers can say the same. 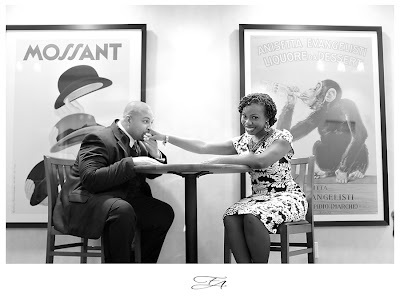 In the last few weeks, we've received some awesome partnerships that will ensure that our readers continue to get top-notch content and photographs relevant to the African-American wedding experience. One of the most exciting benefits of this is that we will be able to bring you more stories, vendors and wedding/engagement photographs that you won't see anywhere else. We recently started a new Twitter account exclusively for wedding-related tweets, so if you're on Twitter, be sure to add us at Twitter.com/WeddingLuxe. 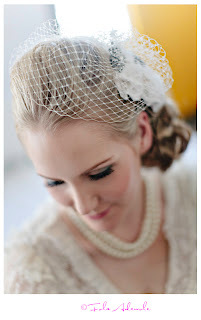 You'll get the latest from this blog and our sister wedding blogs. Do not miss out. Just today we found out that we were leading in the votes for Best Black Bridal Blog. 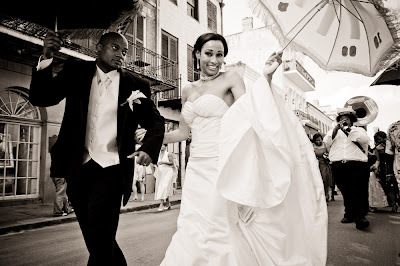 We were also excited to read that Dana Ostomel recently named African-AmericanBrides.com part of "The New Awesome in Wedding Planning". It's hard to believe all of this is about a little website that started as a Yahoo group almost 8 years ago! 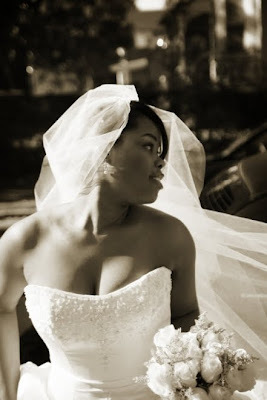 As the editor of African-AmericanBrides.com, I can honestly say that things have never looked better. I've turned off my Google alerts because each search for black weddings has our stories in the top five slots. But read back over the last few pages of this blog and you'll see I have LOTS of help from some fabulous brides, photographers and event planners. Visit their blogs and websites when you get the chance, as they will save you both money and time. 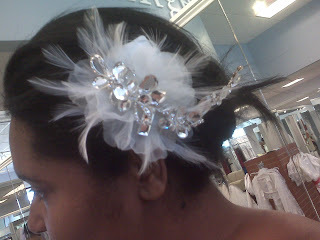 I believe the current economy means African-American Brides' readers deserve MORE and not less. More options, more understanding, more joy and more inspiration. Please continue to communicate with us. Let us know what you like and what you'd like to see more of. Also, please keep those gorgeous wedding pictures and stories coming in! 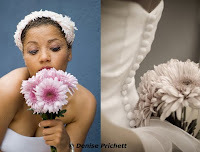 These lovely pictures are courtesy of Denise Pritchett of Denise Pritchett Phototgrahy (based in Based in Bryn Mawr,PA). 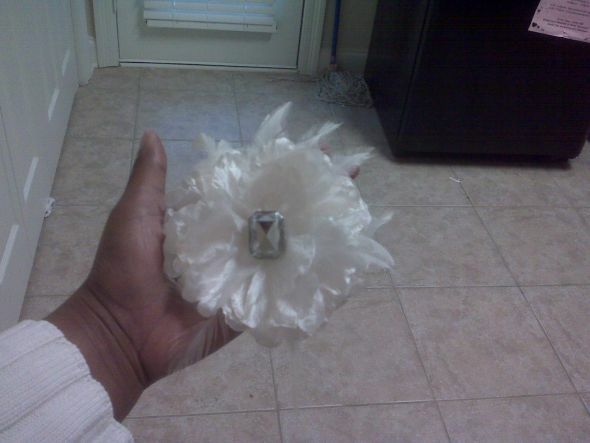 Looking for a chic and inexpensive centerpiece for your wedding reception? Event designer, Minoo Hersini, shares an easy and fun calla lily table display. 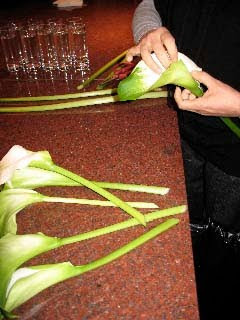 * 7-9 stems of large calla lily. * Vases. You need one calla lily per vase. Depending on the size of the table, you can use one or as many vases as you wish. To create an impact, allow 9" in between. 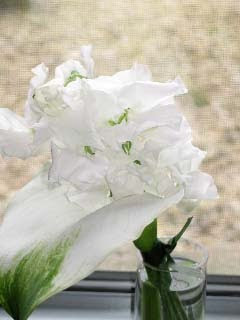 * 9 stems of white sweet pea per vase. 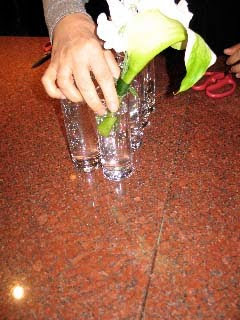 * 1 stem of lily grass per vase. 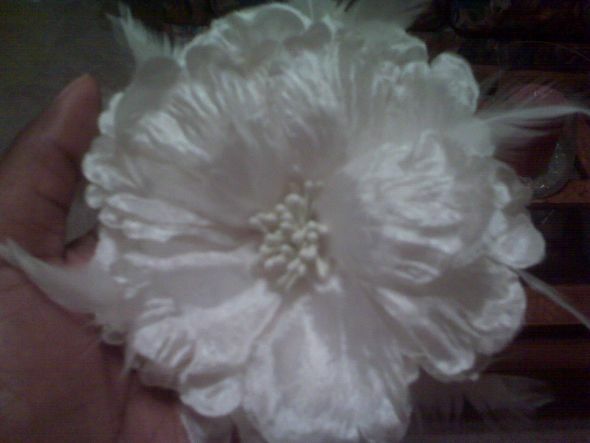 (1) Gently remove the yellow center part of the flower. 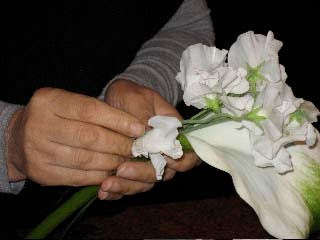 (2) Fill the center of the flower with sweet peas. Add one at a time. 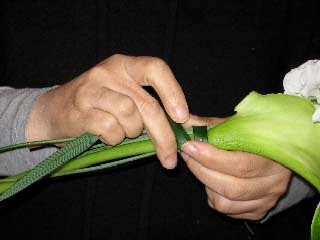 (3) Take one stem of lily grass and gently move your finger through the grass so it becomes softer and can easily bend. 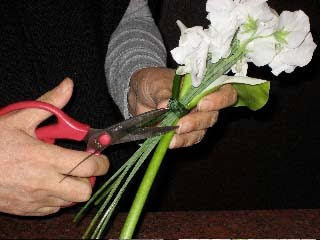 (4) Use the grass to tie your stems. 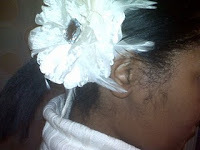 Gently make a knot and cut the ends in an angel. 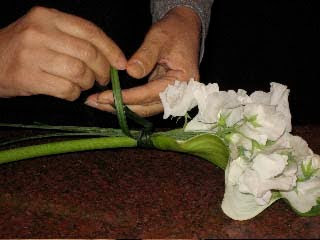 (5) Cut your bouquet in an angel. It's more interesting if your bouquet sits on the side of your glass and is leaning. You can secure the position by anchoring the knot. 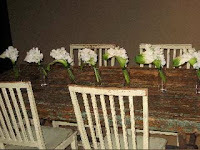 (6) Use the lilies as a centerpiece for a dinning table, a console table or as an accent. I cannot help myself. I have to share my low-cost, DIY hair fascinator. If you have a Claire's, you're in luck!! 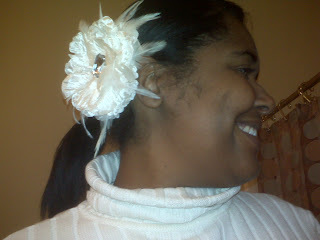 A few weekends ago I scored this great fascinator for $2.75. Here she is in all of her splendor. First, I removed the center pollen, stigma, plastic stuff from the center. I must admit she was pretty cute with it, but I wanted some bling. I used my handy zot (see picture above) to place the stone of your choice in the center (stone/bling, whatever you want to use). You can also use a glue dot or glue gun to attach your baby, if you are feeling really adventurous you can use a hair pin and bend it at the prongs when it goes in. 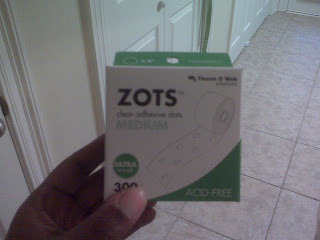 I am lazy and decided to see what a glue zot could do. And below is the result. 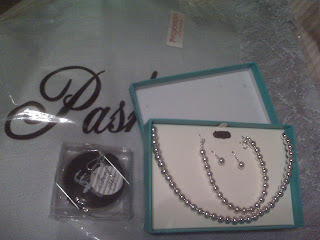 Total cost $11.75. 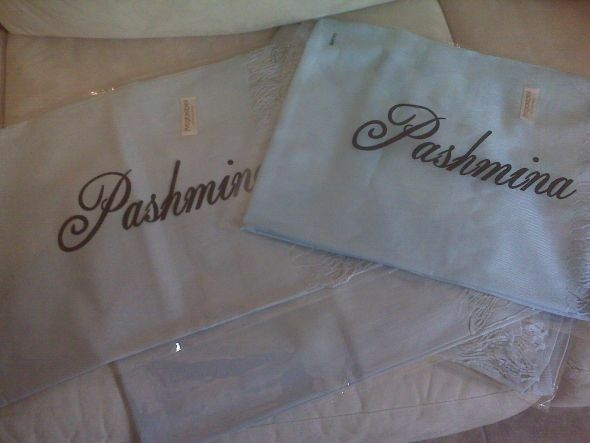 Home weddings provide a very unique background to very unique events. Your home weddings is an extension of yourself and your family. Home weddings are wonderful. 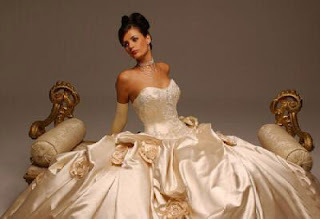 However, there is many aspects about home weddings that must be considered and addressed. 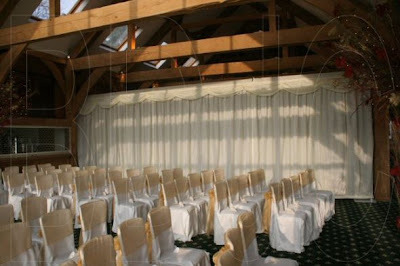 I find that many Brides believe that home weddings are less expensive than a wedding taking place at an outside venue. This is false, and I am going to dedicate this blog to the reasons why. 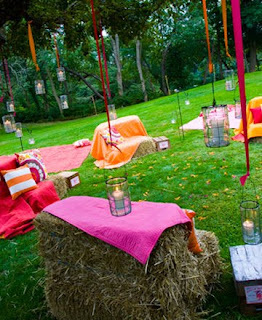 Backyard weddings are a lot more than inviting 100 people and having a dinner in the backyard. Many situations (that cannot always be controlled for) must be planned for and addressed. Let’s take a practical example. 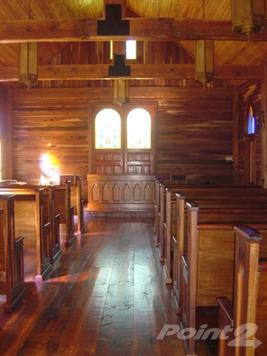 A Bride wants to plan a home wedding for 150 guests in June. Issue 1 - the weather. Question: How can you predict the weather? Look at the Farmers Almanac as much as you wish - If the weather is poor, can you practically seat 150 guests inside your home? If not, you need a tent - even if you are hoping for great weather and do not want to put the tent up. You still need the safety of the back up. You will also need a tent for the caterers (if they cannot work out of the garage or inside the house). Don’t forget the canopy covering the bathroom trailer and any canopies’ leading to or from the tent. Question: Do you have reliable facilities that will accommodate 150 guests? What happens if your plumbing goes sour? Neighbors???? Answer - you need portable restrooms. Question: This is the inevitable question for “at home” Brides. What if it rains? Answer - Either the tent gets put up earlier to help the protect the ground, or you have to install a subfloor. Question: Where are guests and vendors going to park their cars? Answer - there are a number of options. Is your neighborhood one that you can park on the street? Is there enough space for 70 cars? Can you recruit some neighbors to use their driveways and yards? If so, a valet service might need to be hired. If not, is there a park or ride, or some other options for off-site parking (church or school)? If so, shuttles or buses would be necessary. Make sure you make all necessary arrangements ahead of time. Costs - if shuttles are needed, costs could go as high as $4,000.00 depending upon the vehicles hired and the amount needed. Do you want to get everyone to the site at one time, or can you shuttle guests? Question - What are the noise ordinances and parking restrictions in your area? Can you request an exception? What is the process and costs? Do you have to close down a street or ally? Answer - Depending upon your event and where it’s taking place, you must do this research early. If you have to attend a town meeting to request an exception, or go to City Hall to pull permits, it may take some time (more than a week prior to the wedding). Contacting the towns local police department may be a good starting place. Costs - it varies. You can do this for yourself (if you have the time and energy). You can keep it down to less than a few hundred bucks. 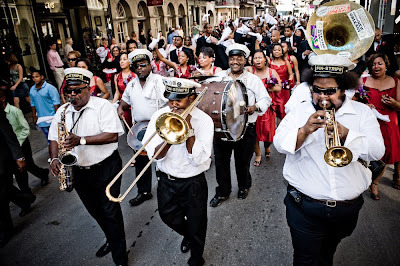 Question - Is all or part of your event taking place at night (after sunset)? If so, you need lighting. Answer - You will need basic lighting inside the tent, around the bathroom area, leading to cars (if the cars are on the property, or off the property if street lights are not present and you do not have a valet service). This does not include specialized event lighting. Costs - varies depending upon what you do. Hire the lighting through the tent company to keep costs down. Question - Does your house (if the wedding site is near the house) have enough electricity to power the DJ/Band, lighting, toilets, catering equipment, etc? Answer - Get a generator, even if you think you have enough electricity. I haven’t even touched the surface, and as you see, having a home wedding really adds up. If you were to rent an already established venue, the flooring would already be present, you would probably have bathroom facilities, the electricity would be taken care of, lighting would be present, etc. Even if your site rental fee is 5,000.00, and you have to rent tables, chairs, linen, glassware, silver, etc (did I mention that you would have to do this for a home wedding? ), you are still coming out ahead - financially speaking. Like I stated before, home weddings are special. There is nothing like them. However, if you are having a home wedding because you think it will save you some dough- I would advise you to think again. Picture courtesy of Kristin Spencer Photography. Have you ever seen a photo so striking that it brought tears to your eyes? For me, my tears came looking at the work of the phenomenal, great and funny Fola Adewole. I saw her work and blinked to hold back the welling emotion. I remember the very first shot I saw, a great and sassy couple on rocks at a beach, she was wearing a gorgeous blue bathing suit, he a cool pair of shorts and they were holding their initials, JB. I thought "WOW. What a cool shot. 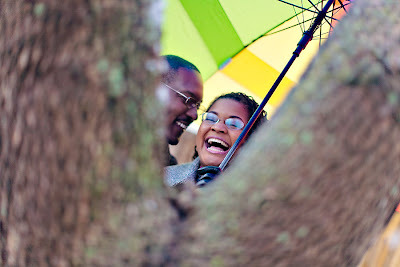 I love that, I wish I could have a photographer like that whenever I am married (insert sigh)". I then shrugged it off, no more daydreaming, I'm not yet engaged, but my clients were, I thought to myself. I then emailed Fola asking if she traveled. I was astonished by her prompt response, her enthusiasm and her prices! I was very happy thinking to myself "Well, at least if one of my clients book her I can use her work for my own portfolio". Little did I know that six months later I would be able to book her for my very own wedding!!! I have a love affair with her artistry, her persona and her talent. To say I cannot wait to see what my pictures look like is an understatement. I honestly hope that my wedding lives up to her talent. For me Fola captures the essence of people, I feel as if I have been given a glimpse into someone's most intimate moments and yes ladies, she is booked, she is mine!!!!! All photos courtesy of Fola Adewole.